Crowne Plaza Madison, WI Accommodations are IdealSince the Crowne Plaza Madison hotel is situated on the east side of Madison, business and leisure travelers appreciate the easy access from I-90 -94 -39 and the convenient, 24-hour airport shuttle to and from Dane County Regional Airport (MSN).In Madison, WI, families have a wide variety of attractions to enjoy. You can take a tour of the Wisconsin State Capitol, visit University of Wisconsin-Madison or spend an afternoon at Henry Vilas Zoo. Madison is home to a vibrant arts scene; guests enjoy The Monona Terrace Convention Center, Alliant Energy Center, Overture Center for the Arts and Kohl Center with exciting exhibits and performances throughout the year. Don't miss out on the area's excellent restaurants, professional theaters and shopping at East Towne Mall.Business trips are a breeze in Madison, WI thanks to our hotel's complimentary Wi-Fi access, well-equipped business center and 10,300 sq. ft. of meeting space for 5 to 250 guests. 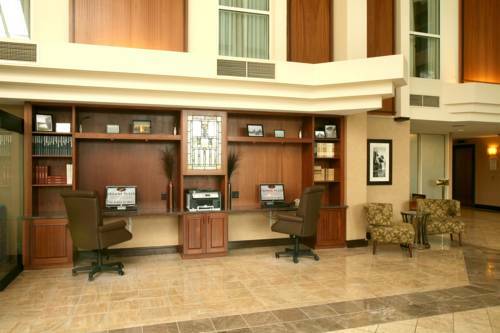 Direct access to our Crowne Meetings Director, Daily Meeting Debriefs and more make us "the Place to Meet" in Madison. At the Crowne Plaza Madison,WI your furry friends are welcome with us. Relax knowing that unbeatable benefits like an indoor pool, complimentary parking, the Crowne Plaza Sleep Advantage Program amenities, The Prairie Caf , Growlers Bar & Grille and a Starbucks kiosk are here just for you. Welcome! Starbucks: The tempting aroma and rich delicious taste of Starbucks coffee available in the lobby of the hotel from 6am to11am. McDonalds: Hours of operation is from 6am to 10pm. Offers drive thru service or dining room. Childrens's program - Henry Vilas Park Zoo is a free Zoo located only 6 miles from the hotel. Three Lakes Ballroom: Our Three Lakes Ballroom offers more than 4,000 square feet of space. The unique space can be configured in a variety of layouts, including banquet rounds, theatres, or classroom style. Three Lakes Ballroom can also be divided into three sections. Mendota, Monona, & Wingra: These three elegant event rooms accomodate guests up to 120, offering a variety of layouts, including banquet rounds, classroom, theatre, U-Shape, or Hollow Square style set ups. Nekoosa & Nakoma: Each boardroom offers 374 square feet of meeting space for meetings of up to twelve guests, configured in a comfortable conference arrangement. Koshkonong & Yahara: Each meeting room offers 702 square feet of meeting space, accomodating layouts of classroom style, hollow square, theatres, banquet rounds, or conference arrangements. Odana Ballroom: The elegantly appointed ballroom features more than 3,000 square feet of space. This event space can be configured in a variety of layouts, including banquet rounds, classroom and theater. The Ballroom can also be divided into two smaller spaces. Odana I: The Odana I room is perfect for any type of event, from banquet rounds to a small board meeting. Odana II: The Odana II room is perfect for meetings and events of all sizes, perfect for banquet rounds, U-Shape, classroom style, or Hollow Square. Kegonsa & Waubesa: Each room offers 560 square feet of meeting space. This unique space can be configured perfectly to fit your needs. Two Lakes Ballroom: The intimate Two Lakes Ballroom is the perfect space for a smaller social function or business event. This is the ultimate setting for gatherings to be configured into many layouts. East Towne MallMadison's largest indoor shopping mall-adjacent to hotel and home to all your favorite stores like Boston Store, JCPenney, and Sears, not to mention other great shops like American Eagle, Bath & Body Works, The Gap and Gymboree. AmtrakAmtrak is located in Columbus WI, 20 miles east of the hotel. Camp Randall StadiumCamp Randall Stadium, built in 1917, is the home for Wisconsin's football team. The current capacity, 80,321, ranks among the nation's largest school-owned stadiums. Overture Center for the ArtsSoaring glass, polished stone, and endless art. Experience our inviting, modern spaces for yourself. Walk in and explore Overture on your own during normal business hours, or if youre interested, sign up for a guided tour. Cascade Mountain SkiSkiing, snowboarding and snowtubing. Rentals available. Call for seasonal hours and pricing. Only 45 minutes on I-90/94 to Exit 106. Go west on Highway 33 for 1/4 mile. Turn left on Cascade Mtn. Rd.